Late last year, we on the Wishpond growth team put on our hard hats and went to work with the purpose of turning our blog into an effective lead generation machine. Before we get too far in, I know there’s a question on some of your minds: what is a lead? Simply put, a lead is a contact who is a potential customer for your business. It’s someone you’ve collected information about (usually an email and some other information like a name or website) with the intention to market to them in the future. Leads are incredibly valuable when it comes to finding new customers for your business. In this detailed breakdown, I’m going to go in-depth into everything we did in 15 hours to achieve our lead generation goals, along with some takeaways you can use to generate leads for your own business. Before starting our lead gen optimization process, we thought long and hard about lead generation as a strategy. Though many businesses can make use of leads, we examined our product, our target market, and the industry around us to see if it was the direction we wanted to take - or if we should have been optimizing our blog to do other things. Leads are made to be nurtured. They’re particularly effective when you need to put a little more effort into convincing potential customers that your business or product is right for them. If you’re selling phone cases, you probably don’t need to rely on extensive lead nurturing to sell your products. On the other hand, if you’re a subscription-based software product like we are here at Wishpond, lead nurturing is a major factor when it comes to getting more customers. We spent hours poring over the pros and cons of lead generation for our business versus a variety of KPIs, discussing the benefits we could reap and the potential risks we could have been taking on. After some time, we were set: lead generation was the right direction for us. So, we set out to build a rock-solid lead generation strategy. The first key to converting traffic into leads is the creation of engaging, high-value lead magnets. Much of our success in lead generation came from creating lead magnets that were interesting to our target market. If you’re not quite sure what a lead magnet is, let me explain. A lead magnet (as the name suggests) is something that pulls in a potential lead - it’s some form of content that people are willing to trade their lead information for. Though lead magnets can vary drastically based on your industry, I’ll go over the ideas for lead magnets we brainstormed during our ideation process. The Wishpond blog publishes 4-5 times a week, and has amassed over 1,000 articles with nearly 300,000 monthly views. That’s a lot of content, which means a ton of ripe opportunities for effective lead generation. One thing we pride ourselves on is having a strong content strategy. This means articles that are substantial - we’d rather publish a 3000-word tome over a 700-word quick read. Though this means we provide as much value for our readers as we can, it also means marketers with little spare time might not be able to make it through an entire article before they need to get back to their work. To capitalize on this, we took our most popular blog articles and turned them into PDF content upgrades, giving people the opportunity to read them later in exchange for their email. 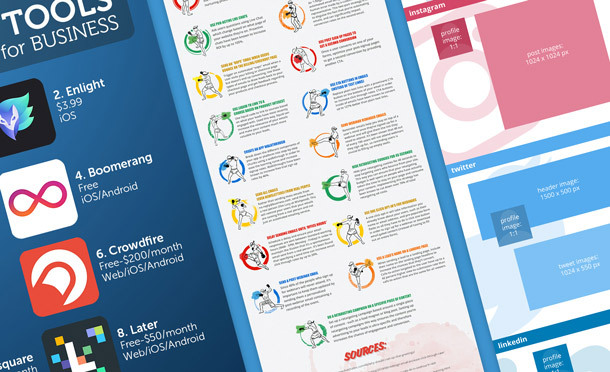 Other types of content upgrades we employed included infographics and checklists. PDFs upgrades are awesome for a few reasons. First, they’re incredibly simple to make. Tools like Google Docs (or your editor of choice) make it incredibly simple to take your articles - images, formatting, and all - and turn them into downloadable PDFs. Next, they address a common pain point: “I love this article so far, but I just don’t have time to read it all right now”. Giving your blog readers an increased number of options when it comes to taking in your content is a no-brainer. An ebook is a bit of a step up from an article PDF or content upgrade. It’s a piece of content that can stand alone on its own merit and value - of course, it’s still important that it’s relevant to the content you’re already publishing so it appeals to the traffic you’re already getting. For our own lead gen efforts, we were lucky enough to have a pretty stacked library of awesome ebooks we had already created for previous lead generation pushes, covering a variety of topics that were interesting to our readers like Facebook Ads and Instagram marketing. However, creating an ebook is a bigger time investment; you’ll want to make sure it’s a topic that’s general enough that you can link to it from multiple articles or pages on your website. You want to maximize the value and longevity of the lead magnets you create, especially when it’s something with as much depth as an ebook. When we take a step back and look at content marketing as a medium, we can see that really, it’s rooted in education. People read blogs, articles and ebooks because they’re interested in learning more about a topic they’re interested in. Here at the Wishpond blog, we know our readers come to us for the latest and greatest when it comes to digital marketing - and that’s why we run webinars. Our webinars teach our potential customers about digital marketing in a manner related to the Wishpond platform; they get people excited about digital marketing and help to build our brand as a marketing leader in their eyes. Webinars fall into this educational mindset - they’re valuable to people because they take a deep and educational dive into a single topic, in a different, more personal format compared to another content form like an ebook or article. If you’re planning to run a webinar, remember that what’s important is planning, planning, planning. From preparation to promotion, you want everything to go just right when you’re on the air. If you feel like you’ll be lacking in viewership, reconsider the strategy or consider running targeted ads to bring in new traffic. Believe it or not, even free trials can be thought of as lead magnets. No matter the plan, we allow all of our users to try Wishpond out free for 14 days so they can see the product and how it can work for them. Our free trial is set up in a way that users need to create accounts when they’re starting a trial. If a user starts a trial and decides not to stay with us, they become a lead. Basically, we already know they’re interested in our product - as opposed to someone who’s a good sales prospect because they’re interested in digital marketing, somebody who was interested enough to try our product is somebody who’s done most of the work for us. Though they may have canceled, they’re valuable because we can identify their biggest pain point and seek to remedy it. Trials won’t work for everyone, obviously. Still, if that’s an option for your business, you should keep a close eye on the people who start one. As the marketing team for a platform with some powerful contest tools, we’d be hypocritical if we didn’t use them for our own marketing efforts. We’ve found huge success with contests in the past, and we knew this would be an integral strategy when it came to finding success with lead generation. Everyone loves free stuff - and offering them the chances to win a prize of significant value isn’t a bad way to get them to fork over their name and email address. We find our contests drive the best results from us when we’re running them with a friend of ours - another company that shares a similar target market. Partnering with another relevant brand can drastically increase the reach of your lead gen efforts. At this point in time, we had our arsenal of lead magnets. And they were good ones, as you can see. The next step we needed to take was one of the most important - we had to find a way to get these lead magnets to our readers. And trust me, it was no easy feat. Everything - well, most things - we do are data driven, and this was no exception. We wanted these lead magnets to reach as many of our readers is possible, in a manner that would give us the highest chance of generating a lead. Of course, time and resources are limited. Our first lead generation push focused on a single key strategy we felt would bring us the greatest results based on past successes. We decided to focus on implementing two specific lead magnets: content upgrades and ebooks. Webinars, contests and others would come eventually, but not until later on. As I mentioned earlier, the Wishpond blog has a lot of content. Like, a lot. This turned out to be both a blessing and a curse when we were implementing these our new lead generation strategies. To give you a better idea about the distribution of the view count on our content, I’ll share a little insider information. Our 10 highest-traffic articles gather about 90,000 views monthly, which accounts for about a third of our total monthly blog traffic. That’s not too shabby, I’ll admit, but we’re the “think big” type here at Wishpond. We knew that only implementing a lead generation strategy on our top 10 articles meant we were wasting traffic from the other 210,000 pageviews on our blog each month. So we made our “top 10” our “top 300”, which added up to over 290,000 pageviews, a much more respectable proportion of our readership. The task we thought would have the highest impact on our KPI was adding PDF content upgrades and ebooks to each of these posts, as it was the most efficient way for us to create a huge number of lead magnets tailored to each post. Over time, this strategy did indeed end up being our biggest driver of leads, and it’s the strategy I want to dive most deeply into in this breakdown. As I mentioned earlier, we were lucky enough to have a pretty massive library of ebooks, which made our jobs much easier as we simply had to focus on creating our PDF content upgrades. 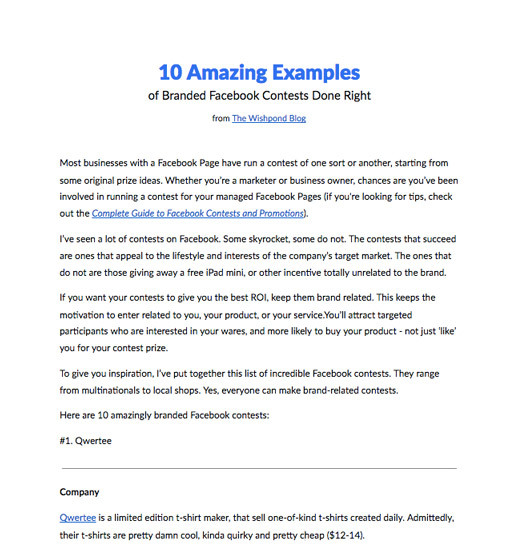 Let’s take a look at a specific article: 10 Amazing Examples of Branded Facebook Contests Done Right. It’s one of our highest-performing pieces, garnering thousands of views for our blog each month. We took the article and turned it into a neat little PDF. Though our close friend Google Docs made it easy to turn the article into a PDF, that was the easy part - we still needed a way to get each viewer to download it in exchange for their lead information. Yeah. Not so pretty, huh? Thankfully, we got help from Marya, one of our wonderful designers, to create a CTA that felt more true to the style of our blog (we’re pretty design-illiterate here on the Wishpond marketing team). Though it still ended up being pretty simple, it was important to us that our CTAs looked as inviting as possible. You’ve probably heard the famous adage, “If it looks like a duck, swims like a duck, and quacks like a duck, then it probably is a duck.” Our readers aren’t dumb - they knew it was a CTA, and what it was built to do. That being said, we wanted something that felt like a part of our blog - not a sore sight like the previous yellow CTA. 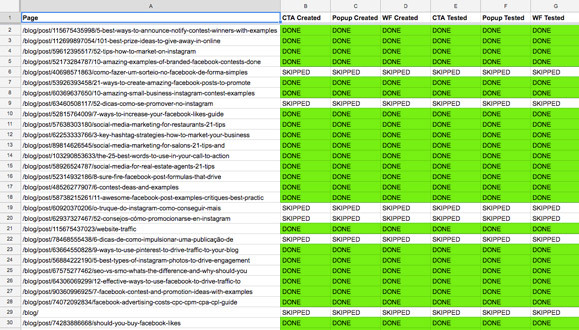 Two hours later, we had quite a few CTAs on our hands for each of our top 300 articles. As a team, we decided to host our forms in popups that opened on the article page. Our readers wanted to read: User experience is important to us. We know that people who visit our blog come with the intention of reading a post and learning something from it. The last thing we wanted to do was to take our readers away from the blog post they were reading to an external landing page to download the article. A two-step download was less intimidating: A CRO best practice is to minimize the number of steps a user needs to take in order to convert. If this was always true, we’d have placed the form inside the CTA - but we knew that seeing a form immediately would be detrimental. Headline: We wanted a simple, benefit-oriented headline. People who clicked the CTA knew what the offer was, so we simply matched the popup’s headline copy. The more interesting part of this headline is “One more step…” Showing visitors that they’re almost there to the conversion goal is a simple way to increase the chances they’ll follow through on their action. Form: We didn’t have a lot of options when it came to the form - we define a real lead here at Wishpond as someone with - at the minimum - a name and email. We also included business URL, to help our sales team do research later on in the sales process. Looking back, we probably didn’t need that field, as we already asked for work email - removing this (thus reducing the number of form fields on the popup) may have helped bump up our conversion rates. The CTA: Again, we chose a benefit and action-oriented CTA button with bold text and a bright color. Our final three hours were spent creating simple email automation workflows to deliver PDFs to the people who wanted to download them. Once a visitor converted on the popup, we sent them an email containing the PDF of the article they converted on. To help generate quality leads: Though our KPI was simply the number of leads we generated, we wanted to make sure these were real leads that we could pass to our sales team. People that entered a fake email either wouldn’t be able to download the PDF, or would have to complete the form again with their real information. To share more content with them: Emailing our new leads gave us the opportunity to send them more content, helping to establish a stronger connection between them and Wishpond and building a place in our leads’ minds as a mecca for great content. Making this decision meant we needed to complete one last step: we had to create and automate an email to send for our PDF article. We used Wishpond’s marketing automation tool to create a simple email containing a link to the PDF download that would trigger automatically when someone converted on one of our popups. 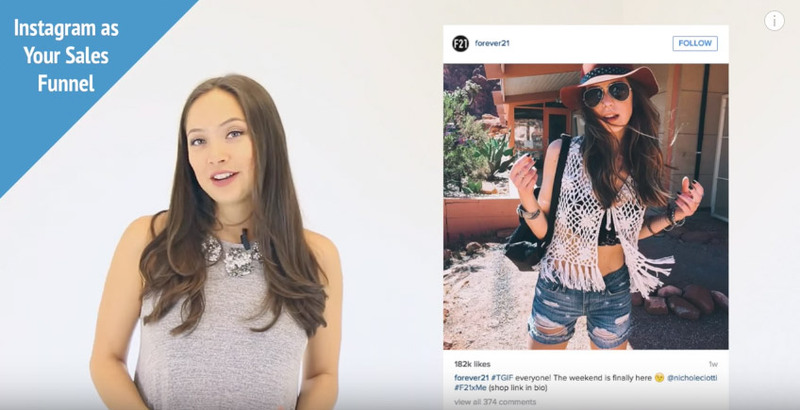 Here's your copy of 10 Amazing Examples of Branded Facebook Contests Done Right. P.S. 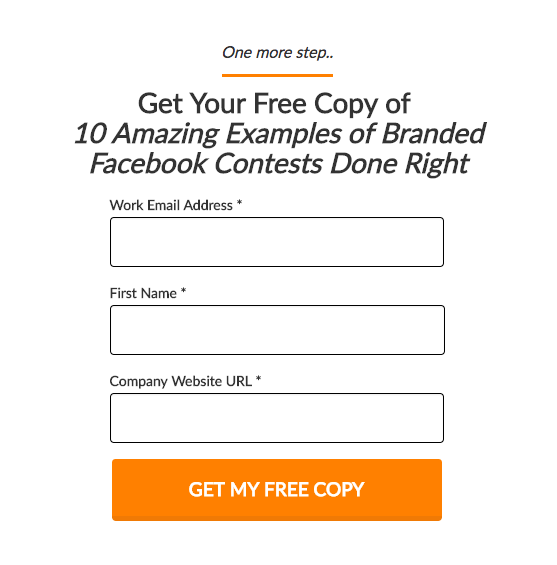 People who read this also liked 7 Facebook Contest and Promotion Ideas & Examples. There you have it - our process for creating content upgrades and adding CTAs and popups to an article. And, like I've mentioned, this is a process we replicated 300 times. Was it a ton of work? Yes - creating and implementing these content upgrades was a process that was the source of many a headache and endless cups of coffee. All in all, the Wishpond marketing team probably spent about 15 hours turning our blog into a lead generation gold mine. But, once it was done, we could tell immediately it would have a huge impact on the number of leads we generated. Once we had set up our lead generation strategies, it came time for the hardest part: letting go and waiting for results. It was time to see if our hard work had paid off, or if we would be left looking for the next great thing. I’ll let the numbers speak for themselves. 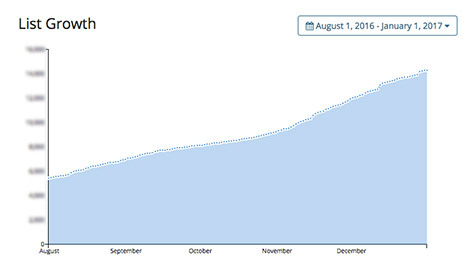 That’s a staggering 140% increase in the number of monthly leads we generated after only one month. I’m no mathematician, but I am a marketer, and I know that’s no small change. In lead generation, rarely will you find an easy victory. Sometimes, you just need to commit to a strategy, do it, and do it big. The decisions we made were data-driven, of course, but we also put our heads down and soldiered through hundreds of articles to implement over 300 unique lead magnets. In the end, we were rewarded with a change in our lead generation greater than we could have imagined. Thanks for reading! I hope you enjoyed this breakdown, and that you took a few things away from this article to apply to your own lead generation efforts. I’d be happy to answer any questions or hear your own lead generation stories - let’s chat in the comments below!